Long-acting insulin analogs, the insulin glargine (glargine) and insulin detemir (detemir) induce a more prolonged, less peaked absorption profile compared with that of NPH insulin , and have been used in the basal-bolus insulin therapy for diabetic patients. 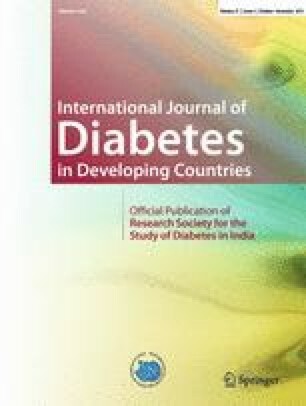 Here we report a type 2 diabetic patient who developed severe insulin resistance due to anti-insulin antibody after 2 years of the basal-bolus insulin therapy using insulin lispro (lispro) and detemir. Switching to three pre-meal injections of the newest rapid-acting insulin analog, insulin glulisine ameliorated hyperglycemia and decreased anti-insulin antibody level. A 75-year-old man had been treated with the basal-bolus insulin therapy by five daily insulin injections: three injections of lispro before breakfast (10 units), lunch (6 units), and dinner (10 units) and two of detemir before breakfast (30 units) and at bedtime (50 units). His body weight was 73.4 kg and height 176.0 cm, BMI 23.7 kg/m2. Plasma glucose (378 mg/dl), HbA1c [9.3% (NGSP value)], and anti-insulin antibody (125I-insulin binding rate, 35.9%; normal range, < 0.4%) levels was significantly elevated. Switching to the combination of glulisine and glargine brought down his blood glucose levels to 106–186 mg/dl by using 10, 8, and 8 units of glulisine before breakfast, lunch, and dinner, respectively, and 30 units of glargine at bedtime. Interestingly, further reduced dosing of glargine remarkably improved his glycemic control, and blood glucose levels were 88–180 mg/dl by using 8, 10, and 8 units of glulisine before breakfast, lunch, and dinner, respectively, and 10 units of glargine at bedtime. However, his anti-insulin antibody level was still high (37.5%). Three pre-meal injections of glulisine (14 units before each meal) and discontinuation of glargine use finally controlled blood glucose (151–195 mg/dl) and decreased anti-insulin antibody level (125I-insulin binding rate, 25.1%). Unlike other insulin analogs, glulisine allows for a viable drug product in the absence of hexamer-promoting zinc, which may provide immediate availability of glulisine at the injection site for absorption , while long-acting insulin analogs were designed to prolong absorption from subcutaneous tissue. The presence of insulin in a monomer form and the rapid absorption from the subcutaneous tissue may result in less anti-insulin antibody formation . Therefore, switching to three pre-meal injections of glulisine from the basal-bolus insulin therapy may be effective in the treatment of patients with long-acting insulin analogs-mediated immunogenic insulin resistance.